I make these cookies every year for my mom for Christmas, and each year they end up modified in some way. This year I traded the chocolate icing for dark chocolate ganache. I really like how they turned out, although mom still hasn’t had them yet since our “Christmas” is actually next weekend. I usually double the base cookie dough recipe and use half to play around with on its own, without the marshmallows and pecans (its great with mint or peanut butter chips added in, or frosted/glazed as you wish). Preheat oven to 350F. Sift together dry ingredients in Cream butter and sugar until light and fluffy. Add egg, milk, and vanilla and beat until smooth. Slowly add dry ingredients and mix until well blended. Scoop out dough on to an ungreased cookie sheet and bake for 7-8 minutes. Place marshmallow halves on top and return cookies to the oven for another 2-3 minutes or until marshmallows are lightly golden and puffy (they will shrink back down as they cool). Heat cream, in a small saucepan just until bubbles begin to form. Remove from heat and add vanilla and salt. Pour hot cream mixture over chocolate and stir until combined. Let cool slightly before drizzling. 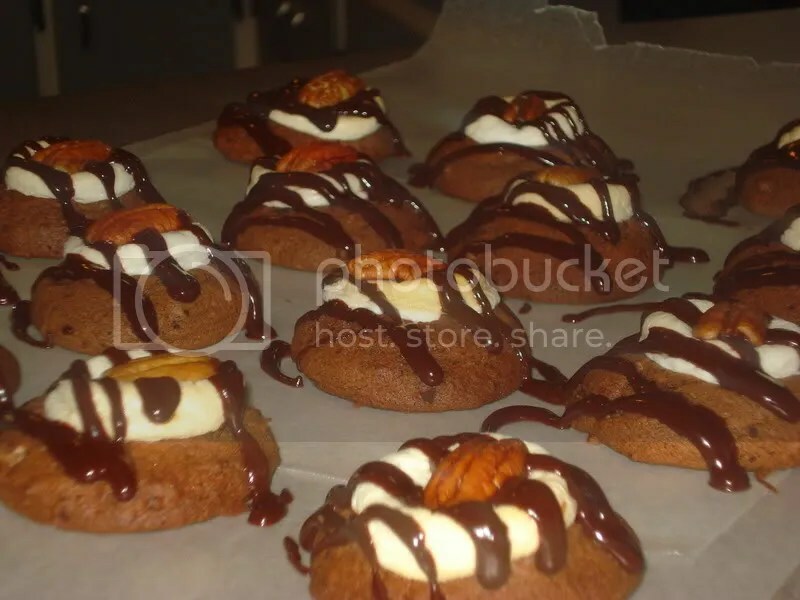 Top cookies with one pecan half and enjoy! * Note on marshmallows: I used to be a vegetarian and made this one year with marshmallow fluff instead of marshmallows (which has egg whites instead of gelatin). It’s a bit harder to work with, but makes the cookies even more ooey-gooey to eat.